Once a week goodness to help you get the most from your mobile research projects. When 1 in 4 surveys today are completed on a mobile device, it’s time to start taking mobile research seriously (if you’re not already!). The growing trend of respondents completing surveys on mobile and tablet devices is not something one can ignore. On the contrary, for those willing to spend some time educating themselves on best practice tips and case studies there are ample opportunities to work this trend to your favour and stay one step ahead of your competition. The challenge for the modern researcher is that, whilst the field of mobile research is exploding, there still seems to be precious few resources in existence from the front line to help you understand what’s actually working and what to avoid. 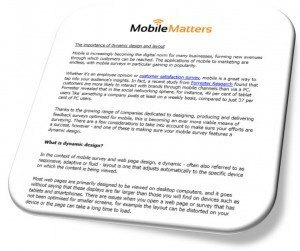 And that’s where Mobile Matters aims to help you. Once a week goodness delivered fresh to your inbox, covering tips and best practice research to help ensure your mobile research projects shine. Subscription is free so what are you waiting for – join the mailing list today by completing the form on the right. NB: Please be assured that your email will be used for the sole purpose of sending you Mobile Matters once a week, and your privacy will be protected. You can unsubscribe at any time in a 1 click process.